This October, Random House re-released the 1987 picture book adaptation of e.e. 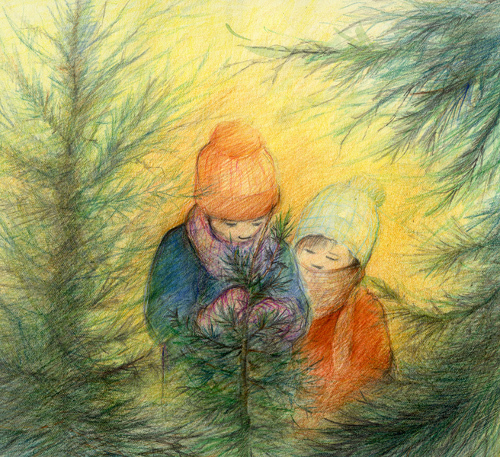 cummings’s poem, “little tree,” illustrated by author and artist Deborah Kogan Ray. (It was also released as a paperback edition in 1994.) Here’s the low-down. 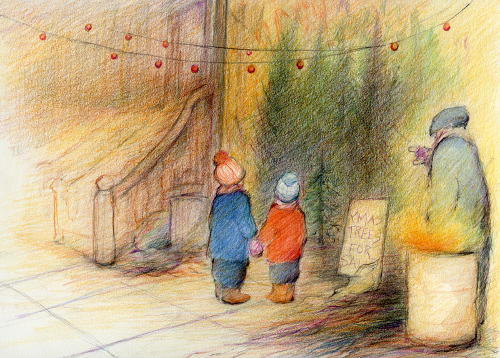 This re-printing makes me happy, as it’s always been one of my favorite holiday picture books. Today, Deborah is sharing two images from it, and I thank her. Merry Christmas Eve from 7-Imp . . .
LITTLE TREE. Text copyright © 1923 by e.e. cummings. Illustrations copyright © 1987 by Deborah Kogan Ray. Published by Random House, New York. Images reproduced with permission of the illustrator. Thank you and Deborah for this wonderful wee Christmas card. Beautiful. These two images alone make me happy; I’m imagining having the whole book in my hands to wonder over. Merry Christmas, and peace to you and yours. Aw, such lovely spreads. LOVE cummings’s poem. Happy Christmas with extra cookies, egg nog, mistletoe and holly. Hope Santa is good to you :). Same to you, Jama — and Fuzzy, too. Love all the holiday illustrations. I recognized Deborah Kogan Ray’s art right away. I have a number of picture books illustrated by her. I hope you and your two little cherubs and your husband have a wonderful Christmas filled with lots of joy! I’m nearly finished with all my baking and holiday food preparation–much earlier than usual. It must be because I haven’t been blogging as much this December. I adore this poem and the illustrations in this book! I am so glad they re-issued it!!! Merry Christmas to you my dear! Merry Christmas, Jules! Have a fabulous 2011!! I missed this book first time around – glad to have a heads-up about it now. Thanks, Jules, and Happy New Year 2011! You, too, Mary Lee and Julie! Looks gorgeous! I will seek it out.